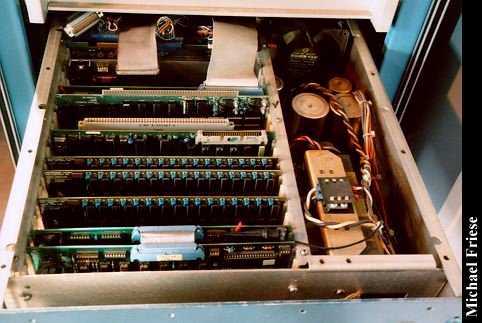 This was a early microcomputer based on S-100 personal computer technology. It ran on a WD16 processor which was a re-microcoded LSI-11 chip made by Western Digital. 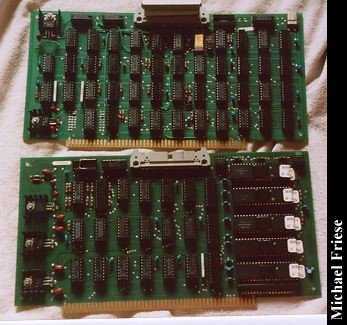 It featured 16 bit operation, completely orthoginal source and destination addressing modes. There were eight main addressing modes and a number of variations. It had block move, block I/O, and multi-bit shifts and rotates. It even had five 48-bit floating point instructions, ADD, SUB, MUL, DIV, and CMP. All running at 2MHz. The company that made it is still in business selling a 68060 variation of the same machine. In its heyday this particular machine had nine users and two spooled printers attached to it. It supported all of them in 352K of RAM. The top box is a 8" 40 megabyte Quantum hard drive. This drive had four platters and eight heads. Next is the CPU. Next is a Control Data Hawk 5 meg fixed and 5 meg removable drive. We backed up to this drive. At the bottom are two 8" single sided floppies with 250K each. Two CPU cards. It all wouldn't fit on just one. Three 64K memory boards. Original configuration had five of these plus some static RAMs. Two 6-channel serial cards. Bauds were programmable up to 19200. The picture at the top of the page is of two CPU cards. The upper card is the sequencer. It multiplexed the 16 bit WD16 CPU down to the 8-bit S-100 bus. the lower card has the five chip processor. From the top you have the ALU chip, the control chip, and three microms. Underneath it all were a set of capacitors used to charge the ROM bus. Click here to view all comments for the Alpha Micro AM100 and to leave your own. Click here to view comments about other Alpha Micro computers.